Thursday was a record high, and boy was it hot. I met Theresa (another former coworker) in Johnson Creek at 11:10 and she drove us to the game in her BMW. After riding in her vehicle I’m thinking about getting my car’s AC checked, because it’s not nearly as cold. We pulled into the Cooper lot at 11:50 and headed right inside. 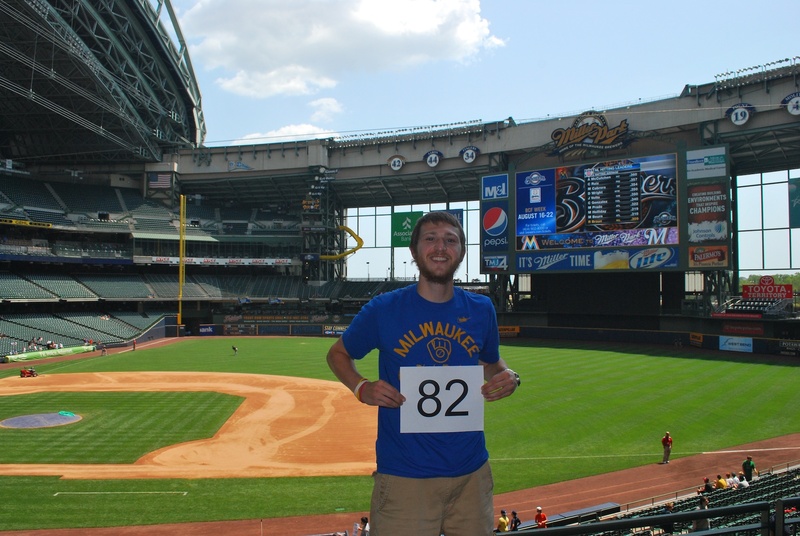 We went to section 212 and got game photo number 82 taken care of. If you scroll down and compare 81 and 82 you’ll notice a huge difference in the sweatiness of my hair and face. The difference came from the fact that on Wednesday I spent 60 minutes out in the sun promoting Be The Match, while Thursday I went right inside. After getting the picture taken we headed down to the team store to pick up a few more shirts and then got a beer and polish sausage. Theresa hadn’t had one before, and like Steve on June 20th she’s a believer now as well. We ate and drank underneath the press box behind section 218 and waited for the game to start. My seats are in the sun until about 3:30 and since it was a 1:10 start we didn’t want to brave the elements. The Marlins scored a solo run in the 4th inning, and that’s all they really needed. They scored one in the eighth and two more in the ninth but since the Brewers put up a goose egg, the bonus runs were just insurance. I know this isn’t much of a game recap, but I’m sure you can find out the details if you’re interested. Braun grounded into three double plays, if that gives you an indication of how the game went. It was just one of those days, it’s baseball. Final Score: Marlins 4 – Brewers 0. Theresa and I were up behind 218 for most of the game. They do the cap shuffle in the sixth I believe, and the Diamond Dancers are involved. They have the camera and the contestant in front of the press box, and the Diamond Dancers hold the three numbered signs. It wasn’t my idea (honestly) but Theresa went over and told them what I was doing and asked if I could get a picture with them. I told Theresa that there was a game going on and I didn’t want to miss any pitches. I gave in and quickly got a picture taken between pitches (and didn’t miss a single one). After the seventh inning we went down to our seats but they were still in the sun. We could see that they were still in the sun but we went down anyways. I swear my head just turned into a faucet and I started sweating profusely. I honestly don’t know how people sat in the sun for the entire game. I’m not sure what you’d call it. Courageous? Impressive? Suicidal? I’ll say not-for-me. 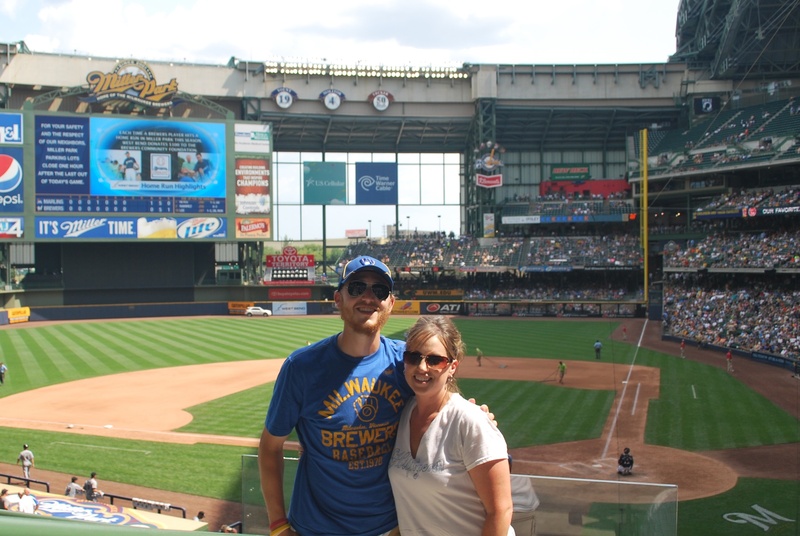 During a pitching change I had a lady in front of us take a picture of me and Theresa. I’ll let you guess who’s who. After about 5 minutes in the sun we scooted down the row (it was empty) and sat in the shade. I almost had another chance at a foul ball when one shot straight back, bounced off the wall in front of the press box and ricocheted back towards us. The guy two rows behind us got it, and that was that. 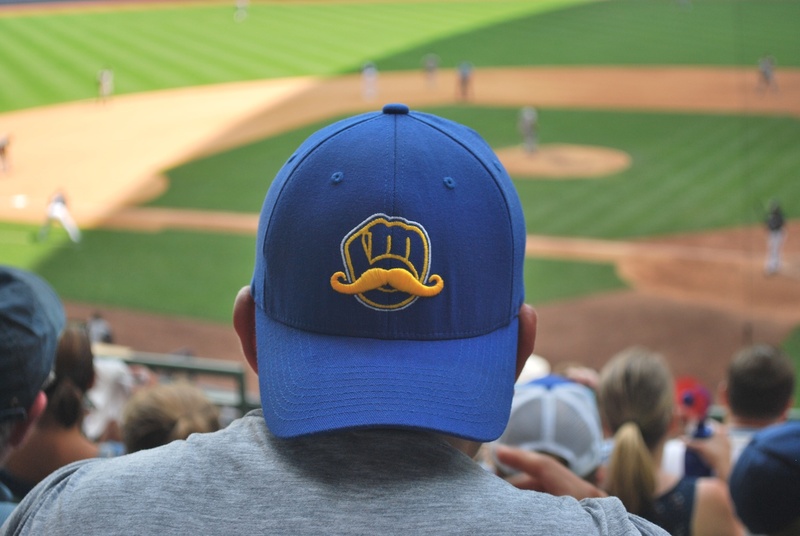 Towards the end of the game I noticed the guy in front of us had a cool hat on that I hadn’t seen before. Good stuff. It was a short post, I know, but there’s a good reason for the brevity. My flight out of Milwaukee leaves at 6:00 am tomorrow morning so I’ll be on the road by 3:15. I connect in Atlanta, and get into Houston at 11:45. It’ll give me plenty of time to take the bus to the hotel, check in, and relax for a few hours. See you in Texas!